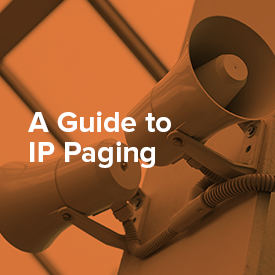 The benefits of a powerful, versatile IP Paging system. Schools, businesses, hospitals, factories - they all use mass notification systems. And many of them don't even think about what they're going to do with that analog paging system that's been there for so long. Rip out old wire, are you kidding me? It's daunting to think about ripping our wire, speakers, and amplifiers from an existing system. IP Paging can be combined with your VoIP phone system and data networks.